QUBE is a puzzle game based around physics and platforming. The game was developed as an indie game and was a finalist in the 2011 Indie Game Challenge. QUBE stands for Quick Understanding of Block Extrusion and takes place in a strange mostly white environment which is made up of blocks. The game is split into a number of rooms and levels which the player must work their way through in order to reach the end. Like other puzzle games the player is slowly introduced to different mechanics as they progress which increases the complexity and difficultly of levels. 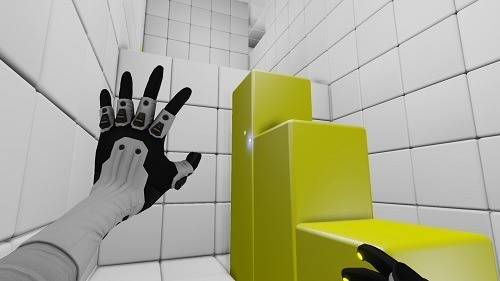 You’ll start your QUBE experience by waking up and realise that you have a strange pair of gloves on your hands (which are used to interact with the environment). 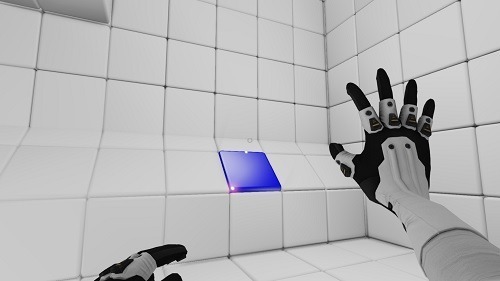 This glove is capable of activating different coloured blocks which are scattered around the game world and all react in a different way when activated. Players will first encounter the red block on their QUBE adventure which will extend or retract when manipulated. Next players will be introduced to the yellow blocks which always come in three and when activated extend to create stairs, with players having control over which of the blocks will be the highest step. Finally comes the blue block which acts like a spring and will propel the player or objects when touched. In addition to the three colours players will also encounter green objects that can be cubed shaped or spherical in nature. Players can’t interact directly with these objects and can only push them into position using the previously mentioned coloured blocks. The gameplay flow of QUBE is perfect with a pacing of puzzles that never gets too difficult before you are ready. A strange block game world. Three different colours of block to master. Additional green objects to push along each level. Great puzzle pacing that slowly ramps up the difficulty with new mechanics.